Nokia has just announced that it has filed a complaint against Apple with the Federal District Court in Delaware, alleging that Apple's iPhone infringes Nokia patents for cellular-wireless networking and Wi-Fi standards. 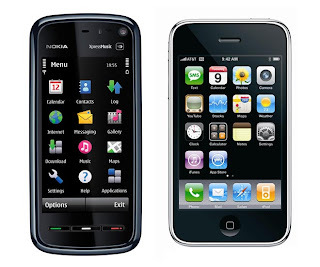 Nokia claims that Apple has violated 10 of Nokia's wireless technology patents. The company says the patents "relate to technologies fundamental to making devices," that are compatible with the GSM, UMTS, or 3G WCDMA, and wireless LAN standards. The claims involve cover wireless data, speech coding, security and encryption technologies. Nokia says Apple has been in violation of these patents since the iPhone launched in 2007. Although the amount of money involved hasn’t been disclosed, CNET News quoted Apple analyst Gene Munster as saying that Nokia would be looking for a royalty payment close to 1-2 per cent ($6-$12) of every iPhone sold. With 34 million iPhones sold to date, that comes to about $204-$408 million in damages. "The basic principle in the mobile industry is that those companies who contribute in technology development to establish standards create intellectual property, which others then need to compensate for," said Ilkka Rahnasto, Vice President, Legal & Intellectual Property at Nokia. "Apple is also expected to follow this principle. By refusing to agree appropriate terms for Nokia's intellectual property, Apple is attempting to get a free ride on the back of Nokia's innovation." During the last two decades, Nokia has invested approximately EUR 40 billion in research and development and built one of the wireless industry's strongest and broadest IPR portfolios, with over 10,000 patent families. Nokia is a world leader in the development of GSM technologies and its evolution to UMTS / 3G WCDMA as well as wireless LAN, which is also demonstrated by Nokia's strong patent position in these technologies.